With all this talk of Steam boxes and Razer Edges at CES, we nearly lost track of Oculus' Rift VR headset, for which dev kits are set to ship in March. Tested's Norm Chan (one of PCG's esteemed alumni) caught up with Oculus VP of Product Development Nate Mitchell for an interview which delves into things like, "Will I need to buy a crazy expensive computer to get this thing to work?" and "When are we going to see a 1080p version?" We've got the highlights lined up for you below. One of the trickiest issues in creating immersive VR is latency—the total amount of time it takes to run each frame through the techno-wizardry that the Oculus uses to put you in the middle of a virtual environment. Mitchell broke down the pipeline as such: it's about two milliseconds for the sensor tracking your head movements to send that data to the computer, 16 milliseconds for your system to render a frame, about 15 or 20 milliseconds to send that visual data back to the headset, and then finally, another 15 to 20 (sometimes more) milliseconds for the pixels inside the headset's stereoscopic panel to switch over. That breaks down with a complex, theoretical branch of mathematics called "mental addition" to about 60 milliseconds, or six percent of one second. That might not sound like much, but it is enough to be noticable and cause a bit of "drift" between when you move your head, and when the image refreshes. Additionally, games streamed from the cloud will add their own, additional latency to the stack. Mitchell told Tested that they're aiming to shave that down to about 30-40 seconds, which he described as "the sweet spot for a compelling VR experience," adding, "Obviously, the closer we get to zero, the more immersive it's going to be." But what kind of hardware are you going to need to run this thing? The good news, according to Mitchell, is that the Rift itself won't add a lot of extra workload to your rig... but you'll need some pretty hefty specs anyway. "You'll want a decent gaming rig," he explained. "Because you want to be running at 60 frames per second, with Vsync, in stereo 3D, and that takes a decent graphics card. The Oculus SDK really adds negligible overhead. There's not really any more overhead for rendering for our device, or anything like that. The onus is really on game developers to optimize their engines to be running at 60 frames per second." 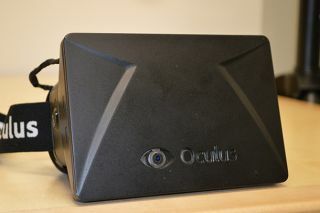 The new dev kit models being shown off at CES are an updated 7-inch display (as opposed to the 5.6-inch prototypes we've seen previously) that are a bit heavier, but feature faster pixel switching and less "screen door effect" that results from looking at a pixel grid from the point-blank visaul range the Oculus requires. There's no word yet on when we might see a bump from 720 to 1080p, nor when a consumer version could go on sale, but we'll keep an... eye on future developments.